Eleanor is now back with her Mom and Dad and we are very happy about that! 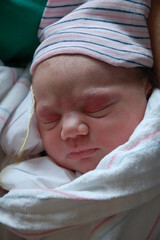 No time to write much else, but I wanted to offer another picture of little Eleanor Jane. Thanks to everyone for their notes celebrating the arrival of our new baby! Congratulations on the birth of your newest daughter! She is precious! Has Anne Marie met her yet? How is she adjusting to life as a brand-new big sister? Hey!!! Congrats! She is beautiful. I can't wait to meet her. Give her big hugs and kisses from Great Aunts Holly and Rachel. Congratulations! Now you have TWO adorable, beautiful little girls.They are both lovely.I know you all must be ecstatic! It makes me anxious to be a grandmother...can't wait.